Percutaneous transthoracic tube drainage was first described in 1938 for the treatment of tuberculous lung cavities. It was later used routinely in the management of pyogenic lung abscesses before the antibiotic era and became the treatment of choice. , However, with the introduction of antibiotics, this procedure gave way to medical therapy. Although 80-90% of pyogenic lung abscesses are now successfully treated with antibiotics, this conservative therapy occasionally fails. ,, This may be due to the virulence of the responsible pathogens, failure to achieve an adequate concentration of antibiotics within the abscess cavity, and/or severe underlying lung disease that may play a role in the failure of the abscess cavity to drain spontaneously. , When medical treatment fails, pulmonary resection is usually advised. However, mortality rates from lung abscesses continue to be substantial, even with surgical therapy, ranging from 15 to 20%. ,,, An alternative therapy in this context is percutaneous tube drainage (PTD). Currently, the role of PTD in the management of pyogenic lung abscess remains controversial. This procedure has not gained widespread popularity; it has been mainly reported in severely ill patients with lung abscesses, who are unable to tolerate lobectomy. Another drainage procedure is endoscopic drainage (ED) of the parenchymal abscess cavities, which was first reported by Metras and Chapin in 1954. ED is considered as an alternative to percutaneous drainage in patients who are coagulopathic, have airway obstruction, or have a fairly central abscess. In this communication, we explore the medical literature focusing on PTD and alternative, potentially effective procedures. We identified and reviewed the English literature relating to this topic (January 1975 to December 2010) via a MEDLINE search using the following terms: Pyogenic lung abscess, treatment, percutaneous drainage, tube drainage, management, endoscopic drainage. Successful treatment was defined clinically as the control of sepsis and avoidance of surgical resection. Radiologically successful therapy was defined as resolution of signs of inflammation, namely, consolidation, pleural effusion, and cavities. The presence of a residual cavity did not indicate failure of drainage. There have been 26 published studies of PTD in the English literature since 1975. However, none of these were controlled trials evaluating the role of PTD in the treatment of pyogenic lung abscesses. All the studies were case reports or case series. We excluded five studies (patients who were actually treated with pneumonostomy requiring operative rib resection or studies at the beginning of the antibiotic era). ,,,, The remaining 21 studies reported 124 cases, including 14 cases of secondary pyogenic abscess, 9 with pre-existing cysts and 5 with lung cancer. The remaining 110 patients had primary pyogenic abscesses. The efficacy, complications, and mortality rate of PTD are summarized in [Table 1]. The success rate as defined above was 83.9% (104/124). The complication rate related to the procedure was found to be 16.1% (18/112). As a complication of the abscess, the overall mortality rate was estimated to be 4.0% (5/124). The size of the abscess itself is also a criterion indicating PTD, since patients with large abscesses are at a risk of aspiration of their own secretions. Surgical drainage of abscesses larger than 4-8 cm in diameter has been advocated by several authors. ,, In one study where the mortality of patients with lung abscesses was reviewed, 22% of 33 fatalities were attributed to aspiration of abscess contents. More recently, larger abscesses were found to be associated with poor prognosis and increased morbidity, but not with increased mortality. Accordingly, a more aggressive approach in treating such patients was recommended. PTD is also indicated in debilitated patients having a cough that is poorly effective in achieving adequate spontaneous drainage. This is particularly seen in an intensive care setting where patients are sedated, intubated, and mechanically ventilated. Another possible indication for PTD is when the abscess cavity does not contain an air-fluid level and is homogeneous because some degree of tension may be present and sudden endobronchial decompression may be disastrous. Moreover, avoiding massive hemoptysis may be a potential advantage of PTD. This may be achieved by providing prompt evacuation of the abscess contents, thereby stopping further growth of the cavity. Although PTD is not usually recommended for the treatment of a lung abscess with massive hemoptysis, it may be considered for hemodynamically unstable patients not fit for lobectomy. This condition was described in one of the seven cases reported by Weissberg et al., and PTD was successful in treating both sepsis and massive hemoptysis. Before considering PTD in the event of failed medical therapy, it is important to rule out bronchial obstruction and bronchogenic malignancy since these are indications for surgical resection and not PTD. This can be achieved by bronchoscopy, which should be performed before attempting PTD. In the current review, however, only one third of the 124 cases had undergone bronchoscopy prior to PTD. Yellin et al. reported three cases of lung cancer presenting with lung abscess in which PTD failed and a lobectomy was performed. Nevertheless, PTD may have a palliative role by relieving sepsis in the presence of unresectable lung cancer. This point was noted by Lawrence et al., who described three cases of lung abscesses associated with unresectable lung cancer that were successfully treated, from the sepsis point of view, by tube drainage. On the other hand, in one study, the incidence of secondary surgical resection after primary drainage was 11% in 295 patients. This is close to twice the number seen among the 124 cases reviewed in this article, which was 6.5% (8/124); this indicates that PTD is becoming more effective, thus avoiding the need for more invasive procedures. In summary, the overall success rate of PTD can reach 84% with a complication rate of 16% and associated mortality of 4% (which is much lower than that associated with surgery). This supports the efficacy and safety of PTD in the treatment of pyogenic lung abscesses. The overall mortality rate in this review was 4% (5/124), which is close to the rate reported in the last decade. In a similar report that reviewed the literature from 1950 to 1985, the mortality rate was 13% in 694 patients treated with PTD. This difference in mortality rates may be due to recent developments in PTD techniques, such as the use of smaller tubes and the abandonment of general anesthesia and rib resection, using more advanced imaging techniques, new developments in antibiotic therapies, differences in the type of patient treated (e.g. patients with different co-morbid illnesses and severities of infection), and/or a difference in the number of cases reviewed. The procedure requires standard flexible bronchoscopy. Under fluoroscopic control, a guidewire is introduced into the cavity through the working channel of a flexible bronchoscope. Selective bronchography may be performed first to identify the airway leading into the cavity. In such patients, the guidewire is directly introduced through the bronchography catheter. When the guidewire is confirmed to be in place, the catheter and bronchoscope are removed. A pigtail catheter, 90 cm long and of a size of at least 7 F, is then slipped over the wire into the cavity. The correct position is checked with the application of contrast medium through the pigtail catheter. The guidewire is then removed and the catheter is secured at the nose. The abscess cavity is flushed twice daily with normal saline. Flushing with gentamycin in normal saline solution once a day has also been reported. At all other times, the catheter is open to gravity drainage. In conclusion, PTD is a safe and effective method for treating lung abscesses, and it is probably the invasive treatment of choice in a medically complicated patient who has failed medical treatment. PTD may also be considered as an alternative to lobectomy, even in patients fit for surgery. However, it is worth remembering that the evidence available regarding the efficacy of PTD is of level 5, that is, evidence is derived from uncontrolled case series, emphasizing the need for randomized trials. An alternative procedure to PTD is ED, particularly in coagulopathic patients, those with airway obstructions, or those with fairly central abscesses. 1. Neuthof H, Touroff ASW. Acute putrid abscess of the lung. Hyperacute variety. J Thorac Surg 1942;12:98-106. 2. Monaldi V. Endocavitary aspiration in the treatment of lung abscess. Dis Chest 1956;29:193-201. 3. Shim C, Santas GH, Zelefsky M. Percutaneous drainage of lung abscess. Lung 1990;168:201-7. 4. Kosloske AM, Ball WS Jr, Butler C, Musemeche CA. Drainage of pediatric lung abscess by cough, catheter, or complete resection. J Pediatr Surg 1986;21:596-600. 5. Klein JS, Schultz S, Heffner JE. Interventional radiology for the chest: Imaging-guided percutaneous drainage of epidural effusions, lung abscess, and pneumothorax. AJR 1995;165:581-8. 6. Vainrub B, Musher DM, Guinn GA, Young EJ, Septimus EJ, Travis LL. Percutaneous drainage of lung abscess. Am Rev Respir 1978;117:153-60. 7. Mwandumba HC, Beeching NJ. Pyogenic lung infection. Factors for predicting clinical outcome of lung abscess and thoracic empyema. Curr Opin Pulm Med 2000;6:234-9. 8. Hirshberg B, Sklair-Levi M, Nir-Paz R, Ben-Sira L, Krivoruk V, Kramer MR. Factors predictiong mortality of patients with lung abscess. Chest 1999;115:746-50. 9. Harber P, Terry PB. 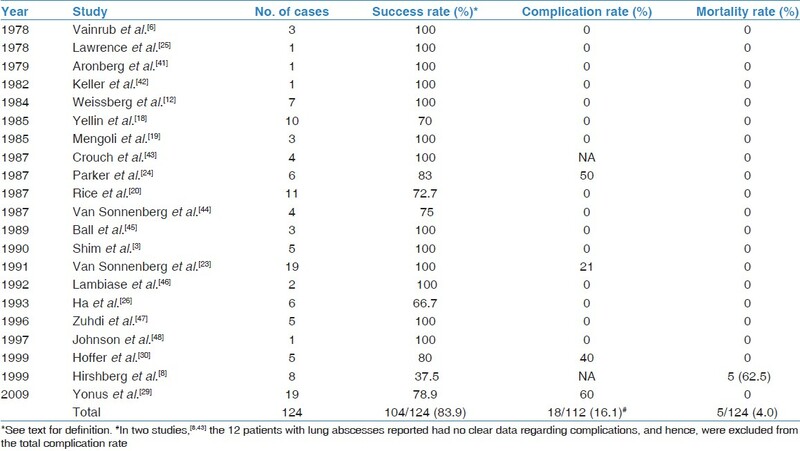 Fatal lung abscesses: Review of 11 years experience. South Med J 1981;74:281-3. 10. Hagan JL, Hardy JD. Lung abscess revisited. Ann Surg 1983;197:755-62. 11. Pohlson EC, McNamara JJ, Char C, Kurata L. Lung abscess: A changing pattern of the disease. Am J Surg 1985; 150:97-101. 12. Weissberg D. Percutaneous drainage of lung abscess. J Thorac Cardiovasc Surg 1984;87:308-12. 14. Delarue NC, Parson FG, Nelems JM, Cooper JD. Lung abscess: Surgical implications. Can J Surg 1980;23:297-302. 15. Estrera AS, Platt MR, Mills LJ, Shaw RR. Primary lung abscess. J Thorac Cardiovasc Surg 1980;79:275-82. 16. Cameron EW, Whitton ID. Percutaneous drainage in the treatment of Klebsiella pneumoniae lung abscess. Thorax 1977;32:673-6. 17. Lacey SR, Kosloske AM. Pneumonostomy in the management of pediatric lung abscess. J Pediatr Surg 1983;18:625-7. 18. Yellin A, Yellin EO, Lieberman Y. Percutaneous tube drainage: The treatment of choice for refractory lung abscess. Ann Thorac Surg 1985;39:266-70. 19. Mengoli L. Giant lung abscess treated by tube thoracostomy. J Thorac Cardiovasc Surg 1985;90:186-94. 20. Rice TW, Ginsberg RJ, Todd TR. Tube drainage of lung abscesses. Ann Thorac Surg 1987;44:356-9. 21. Snow N, Lucas A, Horrigan TP. Utility of pneumonotomy in the treatment of cavitary lung disease. Chest 1985;87:731-4. 22. Wali SO, Shugaeri A, Samman YS, Abdelaziz M. Percutaneous drainage of pyogenic lung abscess. Scand J Infect Dis 2002;34:673-9. 23. vanSonnenberg E, D'Agostino HB, Casola G, Wittich GR, Varney RR, Harker C. Lung abscess: CT-guided drainage. Radiology 1991;178:347-51. 24. Parker LA, Melton JW, Delany DJ, Yankeskas BC. Percutaneous small bore catheter drainage in the management of lung abscesses. Chest 1987;92:213-8. 25. Lawrence GH, Rubin SL. Management of giant lung abscess. Am J Surg 1978;136:143-9. 26. Ha HK, Kang MW, Park JM, Yang WJ, Shinn KS, Bahk YW. Lung abscess: Percutaneous catheter therapy. Acta Radiol 1993;34:362-5. 27. Stark DD, Federle MP, Goodman PC, Podrasky AB, Webb WR. Differentiating lung abscess and empyema: Radiology and computed tomography. AJR 1983;141:163-7. 28. Haaga JR, Nakamoto D, Stellato t, Novak RD, Gavant ML, Silverman SG, et al. Intracavitary urokinase for enhancement of percutaneous abscess drainage: Phase II Trial. AJR Am J Roentgenol 2000;174:1681-5. 29. Yunus M. CT-guided transthoracic catheter drainage of intrapulmonary abscess. J Pak Med Assoc 2009;59:703-9. 30. Hoffer FA, Bloom DA, Colin AA, Fishman SJ. Lung abscess versus necrotizing pneumonia: Implications for interventional therapy. Pediatr Radiol 1999;29:78-91. 31. Yang PC, Luh KT, Lee YC, Chang DB, YU CJ, Wu HD, et al. Lung abscesses: US examination and US-guided transthoracic aspiration. Radiology 1991;180:171-5. 32. Lorenzo RL, Bradford BF, Black J, Smith CD. Lung abscesses in children: Diagnostic and therapeutic needle aspiration. Radiology 1985;157:79-90. 33. Lee SK, Morris RF, Cramer B. Percutaneous needle aspiration of neonatal lung abscesses. Pediatr Radiol 1991;21:254-7. 35. Herth F, Ernst A, Becker HD. Endoscopic drainage of lung abscesses: Technique and outcome. Chest 2005;127:1378-81. 36. Connors JP, Roper CL, Ferguson TB. Transbronchial catheterisation of pulmonary abscess. Ann Thorac Surg 1975;19:254-60. 37. Rowe LD, Keane WM, Jafek BW, Atkins JP Jr. Transbronchial drainage of pulmonary abscesses with the flexible fiberoptic bronchoscope. Laryngoscope 1979;89:122-8. 38. Schmitt GS, Ohar JM, Kanter KR, Naunheim KS. Indwelling transbronchial catheter drainage of pulmonary abscess. Ann Thorac Surg 1988;45:43-7. 39. British Thoracic Society guidelines on diagnostic flexible bronchoscopy. Thorax 2001;56:1-21. 40. Shlomi D, Kramer MR, Fuks L, Peled N, Shitrit D. Endobronchial drainage of lung abscess: The use of laser. Scand J Infect Dis 2010;42:65-8. 41. Aronberg DJ, Sagel SS, Jost RG, Lee JI. Percutaneous drainage of lung abscess. AJR Am J 1979;132:282-3. 42. Keller FS, Rosch J, Barker AF, Dotter CT. Percutaneous interventional catheter therapy for lesions of the chest and lungs. Chest 1982;81:407-12. 43. Crouch JD, Keagy BA, Delany DJ. "Pigtail" catheter drainage in thoracic surgery. Am Rev Respir Dis 1987;136:174-5. 44. vanSonnenberg E, Wittich GR, Edwards DK, Casola G, vonWaldenburg HS, Self TW, et al. Percutaneous diagnostic and therapeutic interventional radiologic procedures in children: Experience in 100 patients. Radiology 1987;162:601-5. 45. Ball WS Jr, Bisset GS 3 rd , Towbin RB. Percutaneous drainage of chest abscesses in children. Radiology 1989;171:431-4. 46. Lambiase RE, Deyoe L, Cronan JJ, Dorfman GS. Percutaneous drainage of 335 consecutive abscesses: Results of primary drainage with one year follow up. Radiology 1992;184:167-79. 47. Zuhdi MK, Spear RM, Wothen HM, Peterson BM. Percutaneous catheter drainage of tension pneumatocele, secondarily infected pneumatocele and lung abscess in children. Crit Care Med 1996;24;330-3. 48. Johnson KM, Huseby JS. Lung abscess cause by Legionella micdadei. Chest 1997;111:252-3. Authors of Document Gomes, M.M., Alves, M., Correia, J.B., Santos, L.
Dieks, J.-K., Von Bueren, A.O., Schaefer, I.-M., (...), Kühnle, I., Kramm, C.M. Authors of Document Otim, R.J., Young, W.J., Kasi, M.